Last December, the Indian government canceled a plan to purchase the Israeli Spike ATGM in favor of homegrown NAG. The Indian Army reportedly has a current requirement for around 68,000 ATGMs of various types and over 850 launchers over the next 20 years. Nag can hit high-speed moving tanks without the support of an operator. New Delhi (Sputnik) — India's Defence Research & Development Organisation (DRDO) has announced that the homegrown Anti-Tank Guided Missiles (ATGM) NAG is ready for induction into the armed forces with the successful completion of its developmental trial on Wednesday evening. In the final, trial which was conducted in Pokhran desert, the third generation missile destroyed two targets at different ranges and timings. "With the successful test flights, the technologies pertaining to ATGM to engage targets in different conditions have been established," Dr. G Satheesh Reddy, Director General (Missiles and Strategic Systems), DRDO, said after the Wednesday test trial. In September 2017, when the DRDO had announced the near completion of the development trials, the Indian Army reportedly voiced concern over certain technical shortcomings like inadequate thermal sensors. Nevertheless, the defense ministry has backed the DRDO's claim that the system is now induction-ready. "NAG ATGM has been developed by DRDO and today's flight tests have once again proved its capability. With this, the developmental trials of the missile have been completed and it is now ready for induction," India's defense ministry said in a statement. The missile is equipped with an indigenous high-resolution imaging infrared seeker, capable of operating during day and night, which provides passive homing guidance for engaging static/moving tank targets. The ATGM has a flight speed of 230 meters per second and is armed with an 8kg tandem shaped-charge warhead. It has a rocket motor using a nitramine-based smokeless extruded double base sustainer propellant, has a single-shot hit probability of 0.77 and a CEP of 0.9 meters, and has a 10-year maintenance-free shelf-life. The DRDO has been working on the NAG (Hindi for "Cobra") since 2009, spending approximately $47 million on its development. 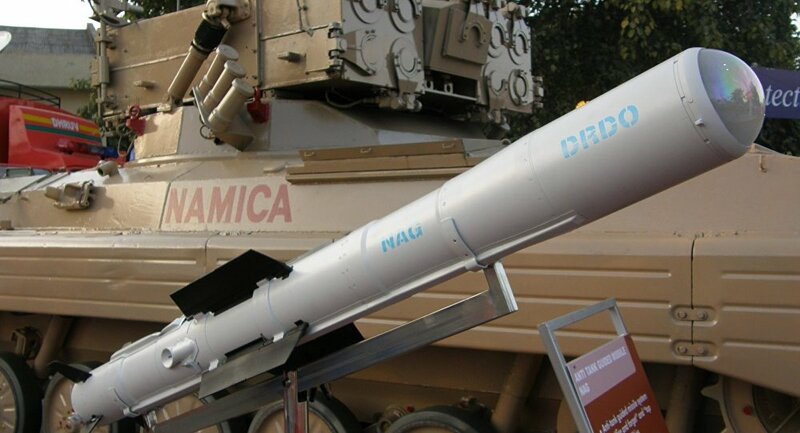 The 14.8 metric ton, NAG is a little bit heavier than the current crop of ATGMs of the Indian Army but it can make up for this shortcoming with its carrier- the NAMICA. Nag is heavier but since it's carrier mounted the extra weight is considered acceptable. The big advantage to the Army would accrue from its easy & cheaper upgradibility. NAMICA is an improved version of the Soviet-designed BMP-2 infantry fighting vehicle that India uses extensively. NAMICA is equipped with nuclear, biological and chemical (NBC) protection, independent gunner and commander sights, silent watch capability, and a fire suppression system for crew safety and comfort. The NBC system provides dry, temperature-controlled filter air to the crew. The NAMICA has a retractable armored launcher that can carry 12 Nag ATGMs, with six of them in ready-to-fire mode at a distance of 4km. DRDO is also developing the helicopter-launched version of the NAG, known as Helina. This ATGM uses the same uncooled LWIR sensor as the NAG ATGM, and has a range of 7km. The Helina, using the "Rudrastra" canister-encased twin-launcher system, will arm both the "Rudra" helicopter-gunships as well as the LCH attack helicopters of both the Indian Army and the Indian Air Force.